Download our colorful posters, blank charts and practice worksheets to assist students of Grade 4 master place values in large numbers. 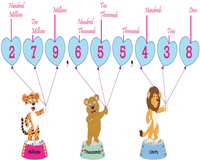 Our handy reference charts make for a great instructional aid to help students recognize the place value of numbers up to 9 digits. 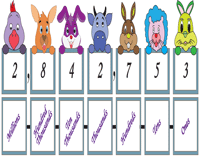 Distribute these vibrantly illustrated place value charts to teach place values in millions. 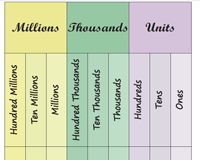 The charts make for a great visual aid to help students grasp the millions place value concept with ease. The position of a digit within a number determines its value. 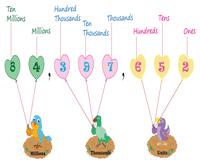 Pin up these vivid posters that contain balloons, number keys, and picket fences in the classroom to aid learners identify the place values up to ten millions. Download and print this array of charts to enhance a student's knowledge in comprehending place values for numbers up to 9 digits. They are sure to love the enchanting illustrations displayed here. Circulate our blank charts among learners to test their knowledge on place values for 7-digit, 8-digit, and 9-digit numbers. Available in both color and monochrome, the charts make for a great evaluation tool. Employ this series of worksheets split into millions, ten millions, and hundred millions to provide children with abundant practice. Get them to master the concept of place values for numbers up to 9 digits. 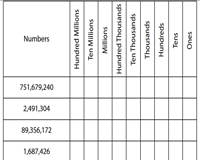 Each worksheet contains a variety of 7-digit, 8-digit and 9-digit numbers. 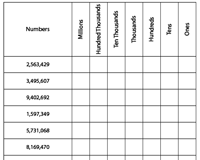 Identify the place value for each number and write them in the appropriate place value boxes.